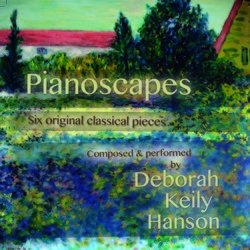 Deborah Keily Hanson’s debut album, Pianoscapes blends the vibrancy and color of the impressionist artists with the beauty and clear melodic lines of the romantic composers. Unique, original and beautiful piano music. Images of musical stories about the oil paintings of my father, John P. Keily. Each piece has a different personality, dedicated to pianists and places, taking the listener on an adventure of sound. Want to order the sheet music?